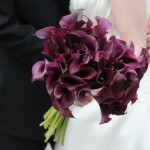 The top 5 Wedding Flower Colors of 2011 (excluding white and ivory, which are #3 and #4 respectively most viewed flower colors on FiftyFlowers.com) are… drumroll please! 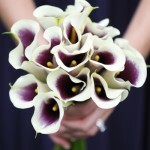 With over 1,000,000 unique visitors per year, 85% of which are brides to be, FiftyFlowers.com is a rich data source for wedding trends and styles. The Top Color categories is based on the most viewed Color Categories on FiftyFlowers from January 1 through March 22 of this year. There are over 52 Color Categories, therefore the Top 5 most viewed are indeed the Colors that have risen to the top of a long list. 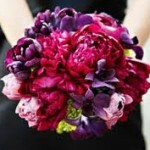 Brides are most interested in seeing Flowers in these colors! Beautiful, Rich, Vibrant colors! And the diversity of these colors is endless, whether you use several colors together, one color only, or pair one color with a neutral like white or ivory. For a summer garden wedding, try pairing Royal Purple, Lime Green, and Dark Pink. For a formal, elegant, or evening wedding try pairing Burgundy with white or ivory or use a rich color like Royal Purple or Burgundy by itself. 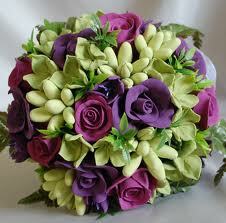 Rich colors like Royal Purple can be elegant but can also add a modern touch. 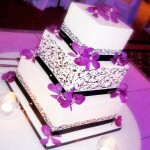 I love how our DIY Bride placed purple orchids on her black and white cake, creating a modern but elegant look. True Blue is also a rich vibrant color that can be taken from a beautiful beach wedding to an elegant and modern evening wedding. No wonder it’s number two on our list! 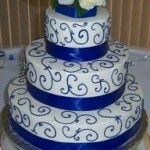 Since it’s also one of my favorite colors, I absolutely love the Royal Blue accent on the cake shown below! Our Blue Dendrobium Orchids are one of our best sellers, and have both True Blue and Tiffany Blue tones in them, which makes them perfect for a beach wedding, just see our DIY couple below! 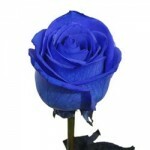 Whether you want an indoor or outdoor, casual or elegant wedding, FiftyFlowers has the flowers in the colors you want! 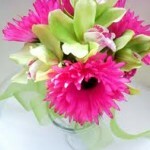 With over 4 dozen color choices to choose from in our convenient Wedding Color category! Floral Pomander Balls in 5 Easy Steps!